Pirate or Pyrates? What Gives?! Nothing really. Today, the words "Pirate" or "Piracy" are spelled with an "I". In the Golden Age of Piracy, spelling was a haphazard kind of thing, and the word was often spelled with a "y". So there was a time when the word Pirate was spelled Pyrate, Pirate, Pyrat, or Pirat. I use pyrates, just for the whimsy and feel of it. Despite what Johnny Depp thinks, pirates were not the rock stars of the 18th century. However as time marches on, the fictional accounts of the common sea robbers has created a romantic illusion of pirate's life. Charles Johnson called piracy "The Great Mischief and Danger Which Threatens Kingdoms and Commonwealths". His fantastic "true" accounts of the robbers and murderers of the sea may be the beginning of the romantization of the pirate's life. But how true were Charles Johnson's accounts and why was piracy romanticized. By definition, piracy is any robbery or other violent action, for private ends and without authorization by public authority, committed on the seas or in the air outside the normal jurisdiction of any state. Because piracy has been regarded as an offense against the law of nations, the public vessels of any state have been permitted to seize a pirate ship, to bring it into port, to try the crew (regardless of their nationality or domicile), and, if found guilty, to punish them and to confiscate the ship. A key point in the definition of piracy: according to international law, is that the act takes place outside the normal jurisdiction of a state, without state authority, and that the intent is private, not political. Thus, although acts of unlawful warfare, acts of insurgents and revolutionists, mutiny, and slave trading have been defined as piracy by national laws of various countries or by special treaties, they are not, in most cases, piracy by international law. (i) on the high seas, against another ship or aircraft, or against persons or property on board such ship or aircraft. (c) any act inciting or of intentionally facilitating an act described in sub-paragraph (a) or (b). Piracy has occurred in all stages of history. In the ancient Mediterranean, piracy was often closely related to maritime commerce, and the Phoenicians appear to have engaged in both, as did the Greeks, Romans, and Carthaginians. In the Middle Ages, Vikings from the north and Moors from the south also engaged in piracy. At the conclusion of European wars during the Renaissance and after, naval vessels would be laid up and their crews disbanded. From among these men, pirates recruited their crews. A common source of piracy, for instance, was the privateer, a privately owned and armed ship commissioned by a government to make reprisals, to gain reparation for specified offenses in time of peace, or to prey upon the enemy in time of war, with the right of the officers and crew to share in prize money from captured vessels. The temptation was great to continue this profitable business after the war without authorization. During the Elizabethan wars with Spain in the late 16th century, treasure-laden Spanish galleons proceeding from Mexico into the Caribbean were a natural target for privateers, and the line between privateering and piracy became difficult to draw. With the collapse of the Turkish Empire in the 16th century, piracy once again became common in the Mediterranean. This new outbreak was due to the virtual independence of the Barbary States of North Africa from Turkish control. Morocco, Algiers, Tunis and Tripoli not only tolerated piracy but sponsored it. This action led to the four countries being branded "the Pirate States". In the early 19th century the Pirate States were suppressed by successive actions of American, British, and French forces. The increased size of merchant vessels, the improved naval patrolling of most ocean highways, the regular administration of most islands and land areas of the world, and the general recognition by governments of piracy as an international offense resulted in a great decline in piracy in the 19th and 20th centuries. Piracy has, however, occurred in the 20th century in the South China Sea, and the practice of hijacking ships or airplanes has developed into a new form of piracy. Much of the Piracy in the Caribbean may be related to drug smuggling. In the South China Seas, much of the piracy is typical of the piracy that has plagued the oceans since man first ventured off to sea. Typically, armed thugs will try to sneak on board a ship and try and overcome the crew in an attempt to steal the cargo. Today, the sloop had been replaced by small motorboats. Often ships are attacked while docked and most of the crew is away. Typically the pirates of today are armed with axes and long knives. Occasionally some may have guns. They tend not to fight hard and prefer to flee if the crew manages to organize any kind of defense. "...global piracy increased slightly in the first quarter of 2006. Reported attacks have risen approximately 8% when compared with the same period in 2005. The actual number of reported piracy attacks in the first three months of 2006 was 61, a modest increase over the 56 attacks noted in the same period of the previous year." As can be expected where ever unstable governments are found, piracy tends to flourish. In January, 2006 the seas around Iraq were declared a Piracy hot zone with 10 attacks occurring 2005. no acts of piracy were reported in 2004. During 2004 pirates preying on shipping were more violent than ever in. In that year Pirates murdered a total of 30 crew members, compared with 21 in 2003, according to the ICC International Maritime Bureau 2004 Annual report on pi racy.. The number of attacks reported worldwide through the IMB Piracy Reporting Centre in Kuala Lumpur was 325, down from the 445 recorded in 2003. 06.07.2005 at 0550 UTC at Kingston anchorage, Jamaica. Five robbers armed with long knives boarded a container ship. They threatened duty A/B with knives. They broke locks of storerooms and opened a container on deck. Alert crew raised alarm and robbers escaped empty handed in their boat. Master informed authorities and two hours later coast guard came for investigation. 06.07.2005 at 0030 LT at Dumai inner anchorage, 01:42.3N-101:26.7E, Indonesia. Three armed robbers boarded a bulk carrier. Alert duty A/B raised alarm and crew mustered and robbers escaped in their boat. Master informed authorities but received no response. 06.07.2005 at 0100 LT at Surabaya, Indonesia. Robbers boarded a bulk carrier and stole a life raft and ship's property. Now and then, how has it changed? For the most part, piracy has changed very little over the years. The changes are basically those of technology not motive or method. Today's pirates tend to work in small groups of about a dozen men, operating from an unassuming water craft, perhaps a high speed boat or a fishing trawler, the equivalent of yesteryears sloop. Typically their vessels are not armed. It is more important for them to pass unnoticed when approached by law enforcement or military vessels. For the most part the pirates are lightly armed with knives and perhaps pistols. Occasionally automatic weapons may be present, depending on the area the pirates are operating. There motive is greed. In some cases the pirates may work under contract for a corrupt warlord in a third world country. By strict definition this may not be consider piracy but terrorism if the acts are politically motivated. Often the war lord may have political reasons for the acts but often the pirates are doing it for the money and/or offer of safe-harbor. For the most part, the pirates attack cargo or merchant ships. As with the days of old, they come in from the stern and try to board by tossing grappling hooks at the target vehicle. Also as with the days of old, the pirates sometimes try to get some of their brethren onboard the ship before it sets sails. By doing so, they have an inside man to signal them when is a good time to strike and aid in the boarding. The pirates rely on surprise when it comes to boarding a ship. If the crew puts up a determined fight, the pirates cut and run. If they are successful in capturing a ship, they tend to demand money and other items that are easily transferred to their own ship. Sometimes the pirates will resort to kidnapping in order to make money. This is especially true these days, around the horn of Africa and is very similar to the actions of the Barbary pirates. For the most part, once the pirates have stolen what they can, they tie up the crew and make a hasty get away. As with the days of old, if the crew put a fight, then the pirates may beat or kill the crew. The pirates of today, tend not to venture too far out to sea preferring to work the coastal regions and occasionally the known trade routes. This is all very similar to what the pirates of old did. Unfortunately, our impressions of the pirates of yesteryear is influenced by movies such as Pirates of the Caribbean, Captain Blood, and The Black Swan. Most of the pirates of old were not Black Bart Roberts or Edward Teach. Most did not have mighty three masted ships with 42 guns. Many had fishing sloops with one or two guns and crew a dozen or so men. Often our view of the pirates of old should be reserved for the privateers, a different breed of sailor. The question was posed "why was piracy romanticized?" One reason probably has to do with the history of the world at the beginning of the 18th Century. Spain controlled the Americas. it had the biggest and strongest Navy in the world. It was the superpower. Great Britain wanted to be the superpower. What it lacked was the resources to build a navy strong enough to take on the Spaniards at their own game. The answer was privateering, or a mercenary navy. The privateers became the heroes or rock stars of England and the scourge of her enemies. Because privateers are no longer used by the nations of the world, the distinction between pirates and privateers has blurred. Could this be today's pirate ship? Sport fishing boat or pirate vessel? Hard to tell! Capable of short travel over open seas, and relatively fast, a vessel such a this sport fishing trawler would be ideal for the small pirate crew of today. Passing themselves off as six or seven tourists on a fishing excursion, the pirates can come in close to unsuspecting vessels and do their dirty work. The same type of tactic worked hundreds of years ago when well built fishing sloops were used by coastal pirates. How would today's pirates manage to afford such a start-up vessel? They can't! They obtain their boats the same way pirates did hundreds of years ago. They steal them! Gone are the days of the cutlass and flintlock! 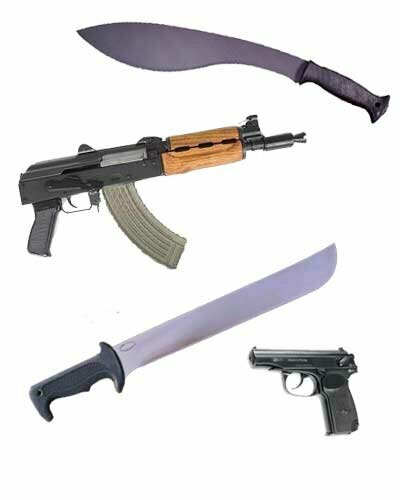 The cutlass has been replaced by large knives such as the Kukri (top right) and a military style Machete (bottom left). A more common fire-arm would be a 9mm pistol; such as the IZH-71H (lower right). This handy pistol is the export version of the Russian Military Makarov Pistol, chambered to fire 38ACP (9 mm short) ammunition. It is common catch in Malaysia and around the Horn of Africa.